“Campaign Ad” was an episode that contained almost 100 percent comic relief, like an episode of The Simpsons where all the jokes are commented on in some way, but not in a bad way. At one point, Ron is talking to Chris about getting lunch, he says no, Chris starts laughing, and suddenly they’re at the restaurant. What follows is Ron speaking to the camera about how bewildering the whole experience was. He wonders if he was drugged. Later, Leslie creates a campaign ad that highlights so many positive things about herself that the list has to fly by on the screen, and the entire room squints trying to read all the bits and pieces. The episode was joke after joke after joke, grounded by the characters’ realizations that they’re entering into ridiculous terrain. It doesn’t get more ridiculous than Bobby Newport—a clueless heir to the Sweetums empire played by America’s goofball sweetheart and ubiquitous charmface Paul Rudd. He’s running for city council against Leslie Knope, and he can barely comprehend that he has any opposition whatsoever, let alone what a city council is expected to do. He’s like the Lionel Hutz of politics (lots of Simpsons references this week and last). Yet somehow the town has reached deep within itself and pulled him up to a 70-point lead. 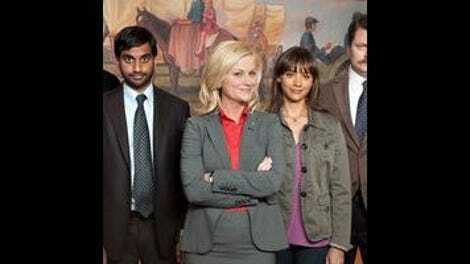 Leslie Knope might love the town of Pawnee, but sometimes that place must make her shake her head at its stupidity. The core problem, though, is that Leslie needs a miracle to win this election, and the only foreseeable option Ben can surmise is to run an attack ad during the Eagleton vs. Pawnee basketball game. Not only is it challenging to attack a person the town has already wholeheartedly hugged with its Sweetums-“enhanced” obesity, but Leslie always dreamed of running a clean campaign. She also dreamed of winning, though, and “Campaign Ad” addresses the concern at Leslie’s core: Can she enter the political arena without fundamentally changing who she is like so many have done before her? The answer coming out of “Campaign Ad” seems to be “sort of.” Leslie Knope (or as Bobby calls her, “Esney Lope”) finds a way to mix the side of her that knows what’s right with the side that has to put on a strong public face. Ben and Leslie spend a lot of time debating the merits of an attack ad vs. a positive one, and not only do they settle on an ad that both parties can agree on, they get an opportunity to show off the new and improved Leslie to Bobby Newport himself. When Bobby sees the ad they put up on YouTube—after losing all the money they spent on trying to air it during halftime, which is a fact that gets kind of lost in the shuffle—he asks to meet them at a restaurant and pleads with them to drop out of the race. Because of his spoiled upbringing, he doesn’t know how to get anything done any other way. Leslie is quick to put him in his place, and warn him that as the campaign heats up, he’s going to be required to debate with her on the real issues, and he’d better be prepared. As this show goes on, I get the feeling that Leslie suffers from some sort of anxiety disorder, or like a low-grade OCD. She has to know she’s gotta get tough during this election, but she fights that side of herself, preferring the cushy confines of her blind childhood optimism. In almost every situation Leslie has encountered over the four years of this show, she’s the one getting in her own way—convinced that there’s some magical solution located in her head if she just gives it enough thought. She’s only able to relax and go with the flow when she’s exhausted every conceivable alternative, or in this case been physically exhausted from fighting Ben on the floor of the TV station. I mean, there’s not a single bone in Leslie’s body that’s hateful or unlikable. I just think she’d benefit from some therapy. Hilarious! In any case, Leslie gets her wish. They run the campaign the way she always wanted to as a kid, sans Mr. Belvidere sadly. I also thought it was a pretty excellent storyline. The show found a way to completely flip a David vs. Goliath story so the two parties switched sides. And all it took was time. The more we saw about Bobby Newport—the more Ben, Jerry, and Tom said his name in a menacing voice—the more we started to see Bobby as nothing more than a little blip on the radar. The story unfolded nicely, and there were laughs along the way. Bully to you, fine show. The rest of the episode had some incredible highs, but came off as pretty meaningless, especially the Andy/April storyline. Continuing the joke trajectory where Andy is trapped in arrested development, the episode focuses on his complete inability to take care of himself and slow realization that he’s got a lot of serious medical problems that cost serious money to fix. (It starts, as it usually does, with an incredible Chris Pratt pratfall.) Meanwhile, April is trying to be the responsible one, but winds up at almost as many doctors as Andy does. Many painful procedures and equally silly pratfalls later, the two are back to where they started, albeit nursing the wounds of running one’s head—or “brain helmet”—into an ambulance and then calling a different ambulance for help. I’m usually a big fan of anything Andy and April-related, but given how seriously everyone else was taking the rest of the episode, and how there was plenty of comic relief over there, it felt tacked on to include a completely over-the-top comic relief story for those two. Of course this is like two or three percent of a complaint about something that was overall pretty solid. Same with Ron and Chris’s unexpected friendship, beginning when Chris asks for Ron’s help delivering bad news. At first it seems like the perfect partnership: Chris is always upbeat, and Ron is the guy who loves making people feel bad at work. It reminded me a lot of the way Chris and Ben used to interact. Then the show specifically called that out, and some of the fun of that discovery deflated. Still, the explanation as to why Chris took an interest in Ron wasn’t as simple as “surrogate Ben.” Chris has grown as a person; as he says himself, “I’m not lonely. I have me.” And now he also has…[pause] KyleDennis. Glad to see Leslie's gift to Ron is serving some use, though Chris is far too quick for that. "I bet on all the horses." "Some of them are just being a person."